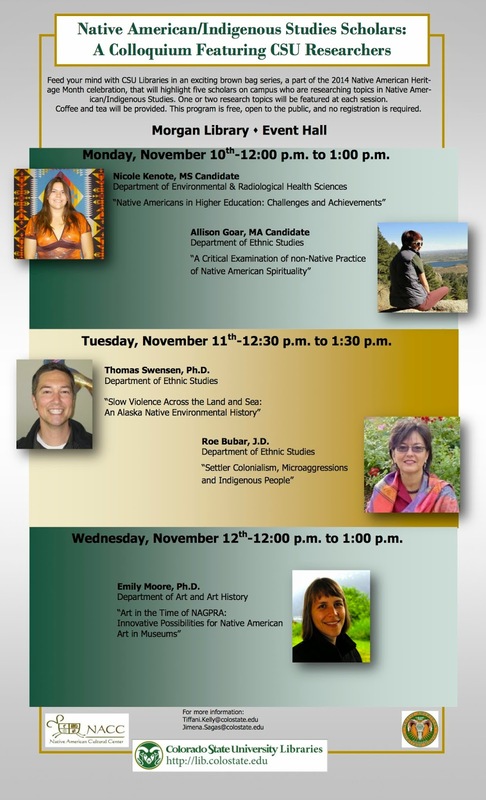 On Tuesday November 11th at Colorado State University I will be giving a talk as part of the Native American and Indigenous Studies colloquium for Native Heritage Month. The next day on the 12th Ketchikan's own Emily Moore will also be speaking on "Art in the Time of NAGPRA: Innovative Possibilities for Native American Art in Museums." Other speakers also promise exciting talks. Check out the post below. My talk Slow Violence Across the Land and Sea centers Native history as a way for connecting United States and Russian activities in Alaska. Each nation's industrial extractive pursuits in the region have led to a extended timeline of devastation, from the 18th century extinction of Steller's sea cow (Hydrodamalis gigas) to the Exxon Valdez Oil Spill in 1989. Moreover, Indigenous compulsory participation in this centuries long violence as impressed flexible labor makes visible an Indigenous geography, a first space, that is fundamental for understanding how Russian and United States endeavors compose one long history in the Great Land.